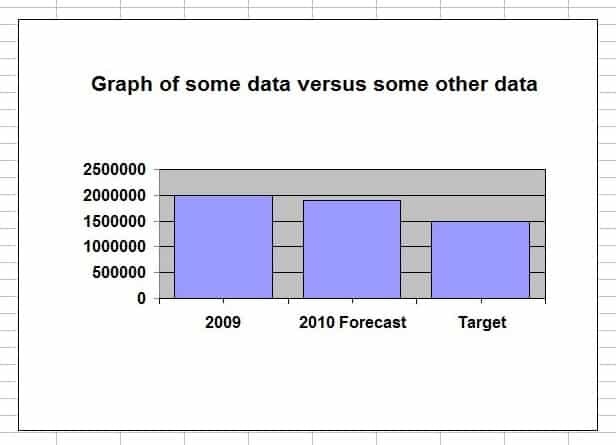 Most people just use the default graphs on Excel, perhaps with a colour change or two. Who says that Microsoft knows how much detail to put on your graphs? The default graphs (or charts, if you speak Microsoft English) are jam-packed with clutter. Why should you care? Every piece of clutter in a graph makes it harder to understand and slower to read. If you have a report full of cluttered graphs then you can scale the loss of clarity. The key is - simple graphs are quick to read and easy to understand - but - graphs that are too simple breed more graphs and we lose the benefit of the original simplification. There's been a strong reaction against cluttered graphs, which you can see with the success of Edward R Tufte's "Sparklines". They are so popular that even Microsoft have jumped in and included them in the latest versions of Excel. These are great, but to be honest few of my clients feel comfortable with that little data on a graph. 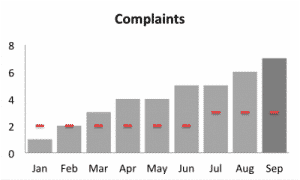 Try putting a graph like this in front of an Operations director and see what he or she says! So what is the solution? It is a BlinkChart. A BlinkChart is much richer than a Sparkline, but cleaner and quicker to understand than an "off the shelf" standard Excel graph/chart. And the good news is that they are pretty simple to create in any version of Excel. Here is an example BlinkChart. Note that is also has target bars on it and uses a darker tone of grey to indicate the current week. It effortlessly conveys more than twice as many data points than the standard Excel chart, but is much clearer and easier to read. If you want to get a step-by-step guide, in plain English, click on the advert below and check out my book, Brilliant Excel Dashboards Manual.